UK Independence Party (UKIP) leader Nigel Farage has failed to cling to his seat in Britain's South Thanet constituency. He has officially confirmed he will resign as leader of the euroskeptic party. Addressing the electorate on Sky News this morning, Farage confirmed he plans to resign as leader of UKIP. Reflecting on his decision, he said he is "a man of his word." In an earlier speech minutes after the loss of his seat transpired, Farage said he has “never felt happier” and that a “huge weight has been lifted" from his shoulders. Farage added UKIP would be the party that will lead“a real, general, political reform”in the UK. 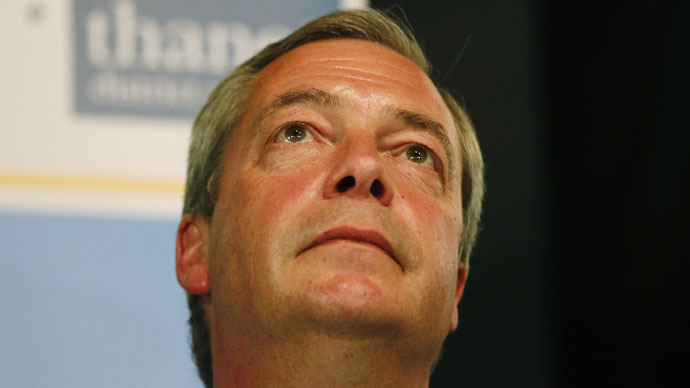 Conservative Craig Mackinlay won the Thanet South seat with 18,848 votes, while Farage polled at 16,026. UKIP became Britain's third party because it got as many votes as both the SNP and Liberal Democrats combined. Nevertheless, it secured only one parliamentary seat. UKIP came second in votes with almost 120 seats, demonstrating the party’s growing reach and influence. Other party leaders expected to stand down include Ed Miliband of Labour and Nick Clegg of the Liberal Democrats.